As we are now on the continent, we though it might be useful to summarise how we got on with travelling around the UK in our motorhome. You can read our Scotland Summary and Wales Summary, but around our visits to these two countries we spent time in England, and our time in England was mostly of a different type than our travelling time with much more emphasis on friends and family. Generally though we found travelling around the UK a lot easier than we had expected. We spent plenty of time in England on campsites because it made sense for the things we were doing, but when we wanted to travel and ‘wild-camp’ we didn’t find it particularly difficult. We also noticed that many communities are starting to get to grips with motorhoming as a leisure activity, and although there are plenty of moaning minnies out there we are sure that we will start to see a lot more motorhome friendly parking options with services like the one we found in Canterbury and the one being proposed in our home town of Exmouth. 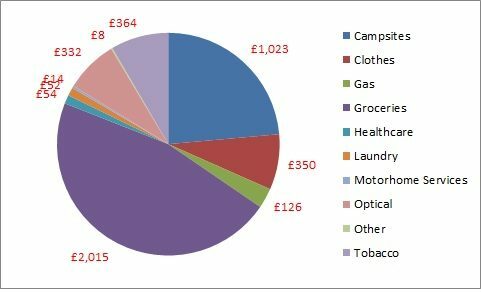 We have spent 162 days motorhoming in the UK, around 44% of the year, so we thought it would be a good time to take stock financially. So how have we got on? I’m sure it will come as no surprise to the people that know me to find out that I have a spreadsheet where I record all of our spending and track it against our budget. 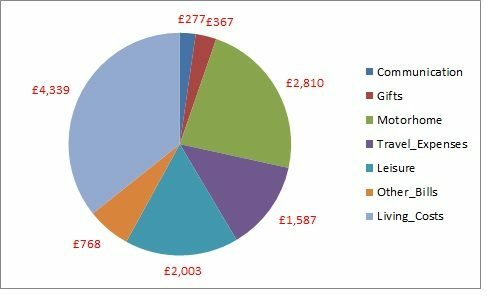 Our budget for the year was a pretty generous £25,000, in total we have spent £11,484, which is 46% of our budget…BUT…we have had our major expenses (touch wood) of MOT, repairs and servicing, insurance etc during these months. Here’s a breakdown of our overall spending. Travel Expenses – Fuel, tolls and ferries. Daytime parking. We have massively overspent on Bertie. not just the costs of MOT failure, but also a complete set of new tyres and fixes for various habitation faults i.e. the water pump and the gear mechanism for the roof. We have also been guilty – no, strike that, we don’t feel guilty at all – of picking up lots of bits and pieces to make our lives more safe and comfortable; additional locks, a new mattress etc. We have also overspent on groceries – as we wander round the supermarkets we really believe that we are being frugal, but the reality is that we shop for what we want to eat, rather than shopping for what’s cheap and we don’t want to change. And we have been very poor at controlling our internet usage. We found that many of our devices – particularly the apple ones – treat our MiFi device as if it’s a bottomless well of data. It looks to them just like any other WiFi that you have at home and so assumes that there are no limits. We had to do quite a lot of tweaking to change the settings to reduce data use and even then we are still finding our home habits of surfing whenever we feel like it difficult to break. As a result we have overspent on data top-ups. This will be even more important to control when we get into Europe where our data limits will be further restricted by providers; despite the removal of roaming charges many providers still have limits and restrictions when data is used in Europe. Otherwise all of our other costs are slightly lower than expected, so we’re pretty happy. Many people say that motorhoming in the UK is far more expensive than in the rest of Europe, but with the current exchange rate I think that costs will be pretty similar across the southern European countries. We will be able to compare and contrast once we’ve done a bit more travelling. On a final note, with our initial income from selling our car and various refunds on bills, plus our income from renting out our house and the general rise in investment value of our savings, our net worth in in purely numeric terms is slightly higher than when we left. I suspect we’re not quite beating inflation though and of course investment values can go down so we’ll have to see what the future brings.